How to Make Creativity a Daily Habit? Why Is Creativity the Secret to Greater Purpose? Knowledge, creative thinking, and motivation are the three essential elements to creativity. This is absolutely, 100% correct. There's a lot of really good information packed into this book. I found this book very helpful. It's not just for artwork but also writing and other types of creativity. I especially found the study on commissioned artwork vs. non-commissioned artwork interesting. The non-commissioned work was more creative. I feel it was that the artist likely felt somewhat under 'pressure' for lack of a better word. And the fact that they knew it had to be a certain way. It comes down to intrinsic motivation and extrinsic motivation. 'Creativity comes from failure' makes sense as well when explained properly. It comes from chaos etc...I have to agree with all this. And the most important thing is having a routine. Along with this, I've found that having things readily available makes the routine much easier. If it seems like a chore to get the artwork out and put it away everyday, a person may be less likely to become motivated therefore cutting into their creativity. Jake Stevens did a wonderful job narrating this book. He made it easy to understand and he has a nice speaking voice. 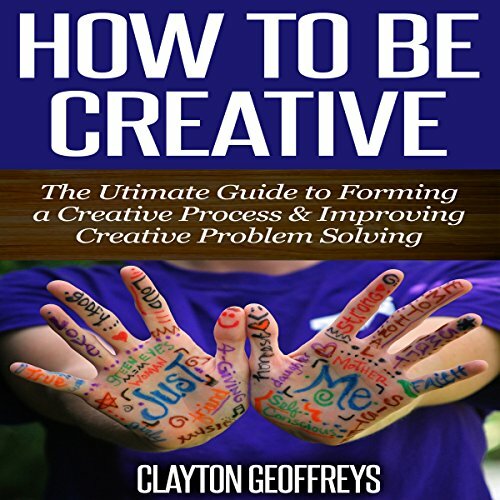 I would highly recommend this audiobook especially if you're looking for ways to increase your creativity. There are many wonderful suggestions I plan to try. Audiobook received in exchange for an unbiased review. This is a short little book on how to become creative, or how to get out of a rut and get back to being creative. If you’re one of those folks that feels life is dull and your glued to your routine, you might well find this interesting. Once again, the author does a great job of packing a lot of info into a short amount of time (I recently enjoyed his book Milk Thistle). The section on defining creativity was interesting and informative. Also, I liked the sections on how to incorporate creativity in your daily life and how to let your creativity grow. There were two case studies on famous creative people: Steve Jobs and Jerry Seinfeld. I have not followed either one other than in passing. I have caught several episodes of The Jerry Seinfeld Show and found the jokes repetitive and therefore, easy to spot on the horizon. So for me, the second example didn’t really work, as the point was to not be repetitive when being creative. Setting that aside, the book used these examples to show that these two famous men didn’t just do one thing with their lives; they had several projects going, usually at the same time. The author shares steps to keeping creativity alive in your daily life and I think these are useful. As a weaver myself, when I get in a slump I often do some of these things and they give me a fresh perspective. Basically, it is just shaking up your routine and doing something you like and that is a bit different from what you had planned that day. The author keeps it simple (like taking detours when walking the dog, or gardening instead of doing laundry, etc.) and I like that he doesn’t turn it into a big production. You don’t need to go skydiving or try out a new-to-you narcotic to get your creative juices flowing. All in all, if you find you are not a creative person, this book could be just the stimulant you are looking for. The Narration: Jake Stevens’ performance was great. He kept a good pace and had the right mix of excited and serious.